Home News Jersey City News Pedal Power on the Hudson River? A new self-propelled party boat will make its way out of Libery Harbor in May. Owner Christopher Coscia, a 30 year-old Staten Island resident, brought this idea to life in New York Harbor after participating in a cycle boat tour on the Chicago River. So he investigated the options. He learned that there is only one company in the country that manufacturers the pedal-powered cycle boat, making it extremely unique. At that point, he began discussions with the U.S. Coast Guard to get clearance to start up a cycle boat service in New York Harbor. After ten months of working diligently, the program was certified, and the staff trained. “Our new boat arrived from its manufacturer in Bend, Oregon after a 14-day journey across the country,” he said. “Each Cycleboat must be fully-certified by the U.S. Coast Guard and manned by a USCG-Licensed Master Captain, while a deckhand provides on board assistance. Safety is our top priority.” Guests over the age of 21 are permitted to bring their own wine and beer, but no liquor is permitted. Prior to this, Coscia, a mechanical engineer employed for an electric company at the main energy control center in New York City, basically only had recreational boating experience, fishing and crabbing. While he is undergoing training himself, he has hired qualified people to oversee the operations. 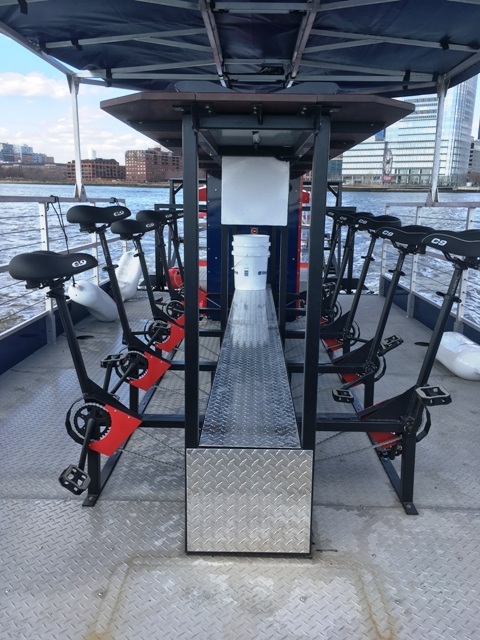 The first of its kind in New York Harbor, NYC Cycleboats is a 16-person pedal-powered fun boating adventure complete with a mahogany bar, ice-filled coolers and a Bluetooth sound system. Up to 10 riders seated at comfortable cycling stations pedal together to propel the paddlewheel vessel while enjoying beverages they supply. The Cycleboat accommodates up to 16 total passengers plus two crew members, which allows riders to alternate time spent cycling, socializing, relaxing on additional non-biker seats, or taking in the views, while a gas motor provides assistance if needed. The 1 hour and 40 minute outing originates at Liberty Harbor Marina in Jersey City, directly across from Pier 11 in Manhattan, and proceeds along the Hudson River with views of the New York City skyline. The typical route passes Ellis Island and circles the Statue of Liberty. “We’ll get as close to Liberty Island as federal law allows,” he said. 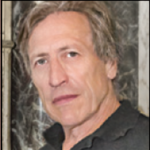 Coscia’s vision is to provide an exciting and safe experience for individuals or groups looking to see New York City in a unique way. Trips are open to all ages and feature all necessary safety equipment including life preservers for adults and children. Coscia also plans on hosting weekly mixers for singles, offering reduced membership rates for frequent riders, and discounts for locals and tourists alike. The cost of these trips vary. There will be corporate type packages for booking the boat for on weekends from $490 to $550, Coscia said. Individual booking will vary from $45 to $49, depending on the time with possible discount days. For more information on trips, which begin May 3, go to www.nyccycleboats.com.